I never jackpotted when I was growing up, but I've since learned that there's a special group of people that spend their weekends together every spring. 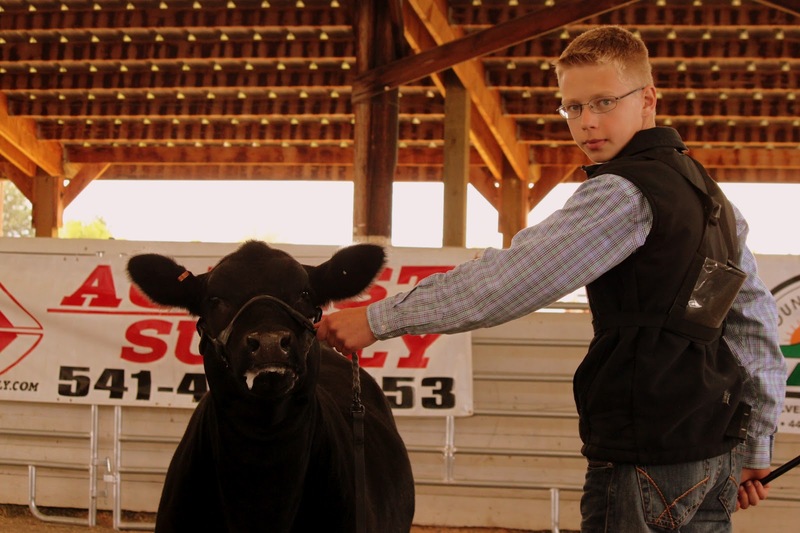 Trailers are loaded and cattle are hauled around the state so that kids and cattle can compete together each weekend. Families wake up early in the morning to wash and blow out their calves, and make sure everything is ready before they head into the ring. But many walk away with memories made. Last weekend we spent Saturday in Madras at the 5 Peaks Classic. The Ellis & Bartels family had put together a great two ring jackpot for kids to compete in. A two ring jackpot means that kids pay two entry fees, and are judged by two different judges. One heifer might win in one ring, and a totally separate heifer may win in the other ring, since you have two different opinions. It's a great format because basically, you get to compete in two separate jackpots, but only have the travel expenses of one. And I think everyone knows how expensive fuel is! It was a great day, filled with great people, and great cattle! PS - Lindsay's birthday was yesterday. She's out of town on vacation this week, but we got to see her for a little bit on Saturday when she and Henry stopped by. Happy Birthday Paco!